Established in 1832, Bristol General Hospital finally closed its doors in 2012. Having been acquired by City & Country, the award-winning heritage property developer approached Carousel Lights in order to bring some wow-factor to their latest development. as support text. It was then down to Carousel Lights to work out the best way to produce the architectural neon signage. 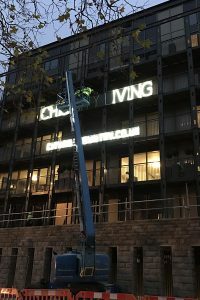 We knew that the neon would need to be removed and re-sited once all of the apartments had sold, and as such, it was important that the neon signs were installed safely and securely but with the capability of being moved at a later date. Two pieces of work were then started concurrently. 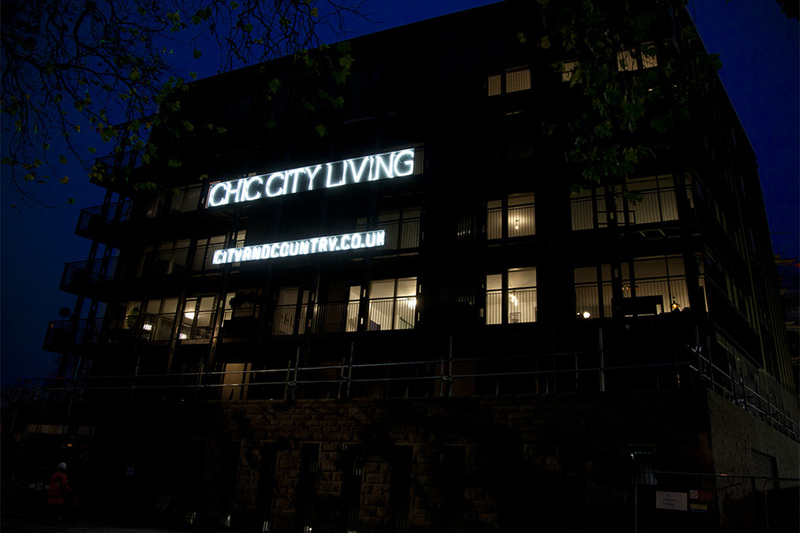 Firstly, mirror-image life-size templates were printed of the CHIC CITY LIVING text measuring approximately 9 metres wide. 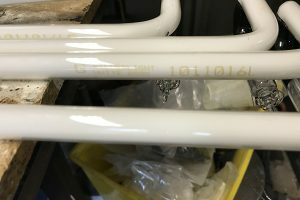 15mm canes of Silverlight White 6500 glass were then hand-bent to the pattern of the text and then pumped with gas. 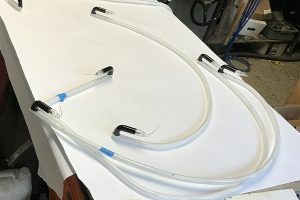 Blackout paint was then applied to the electrodes and the different sections of neon glass were completed. 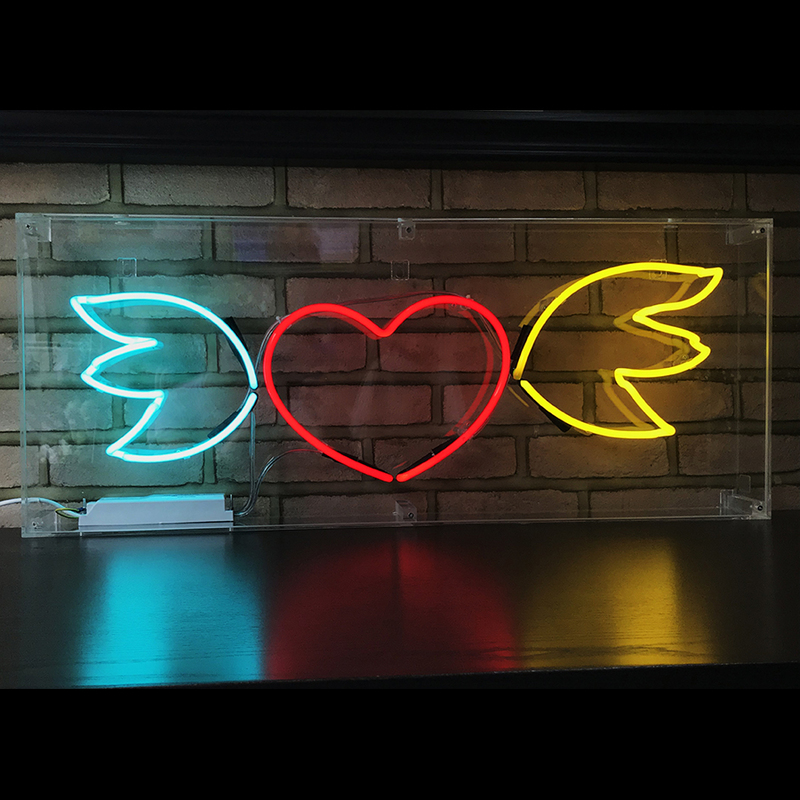 Concurrently, mounts were created for each line of neon. 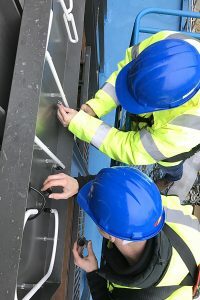 Created in 5 different sections that could then be located adjacent to each other on site, steel was powdercoated in RAL7022 Satin to match the painted metalwork of the apartments. Trough mounts were used so as to give the glass a little protection from falling objects above. All the elements were now complete and ready for on-site assembly. The road was closed whilst an access platform was put into position. 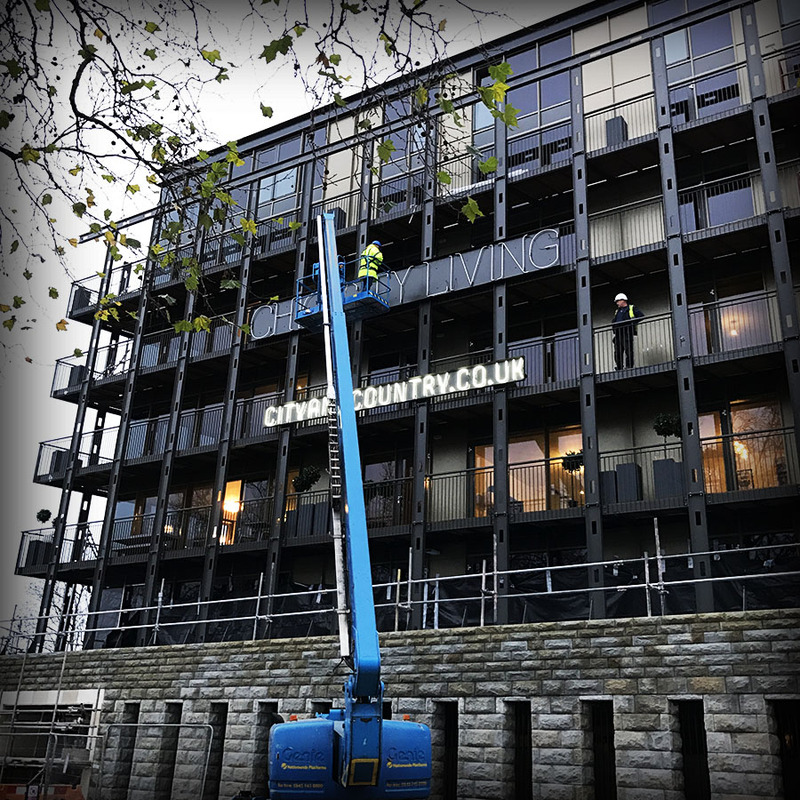 The powdercoated mounts were fixed to the front of the balconies first, following which the glass was then individually mounted to each mount whilst touch-up paint was applied to the glass and mount to make sure they looked in perfect condition. 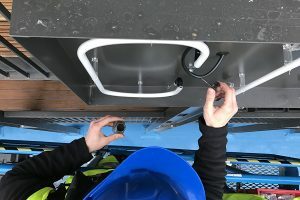 Lastly, the transformers were located in position and were connected up to the glass on one side and the mains supply on the other. 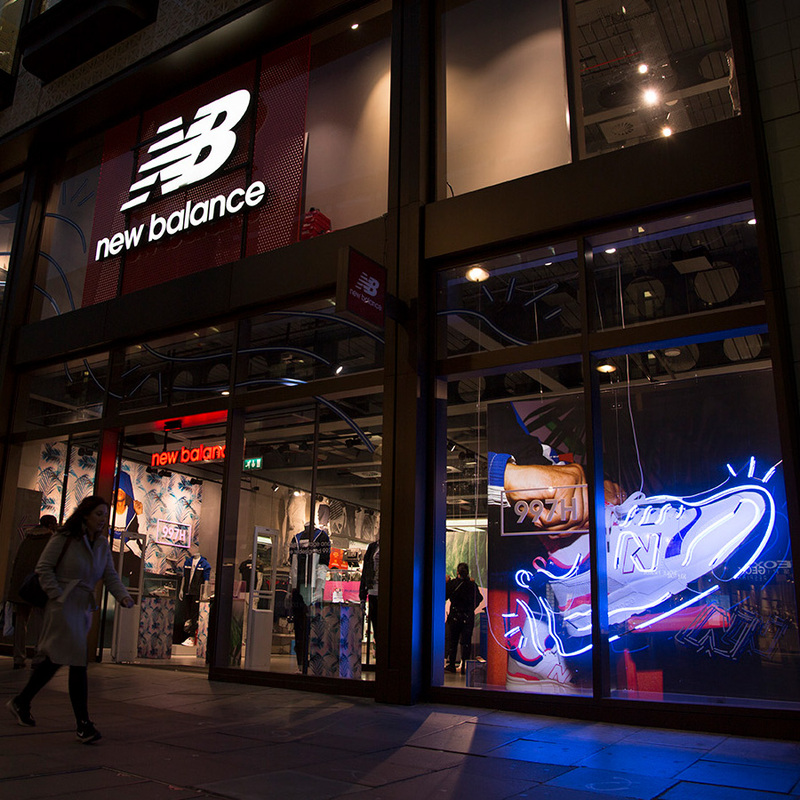 As darkness fell, the neon signs were turned on in anger. 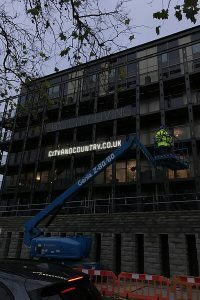 With the property sitting on the river Avon, the architectural neon signage stopped people in their tracks and acted as the cherry on the cake to what is a beautiful renovation of such a historical building.